The official language of the Conference is English. Please be aware that the official language in Austria is German. The weather in Graz in September is cool and can be warm with occasional rain. The temperature typically range from 21°C to 11°C with an average of 15°C. The time zone in Austria is Central European Time (CET) (UTC plus 1 hour)​. More information about Graz are available at Wikipedia. The Conference Organizing Committee or Organizers or Secretariat cannot accept liability for personal accidents or loss of or damage to private property of participants. Participants are advised to take out their own personal travel and health insurance for their trip. Please be advised that photographs will be taken at the event for use on the conference website and in the press, social channels, and other publications. Should you not like for your image and likeness to be used, please let us know at bci2017noSpam@tugraz.at. 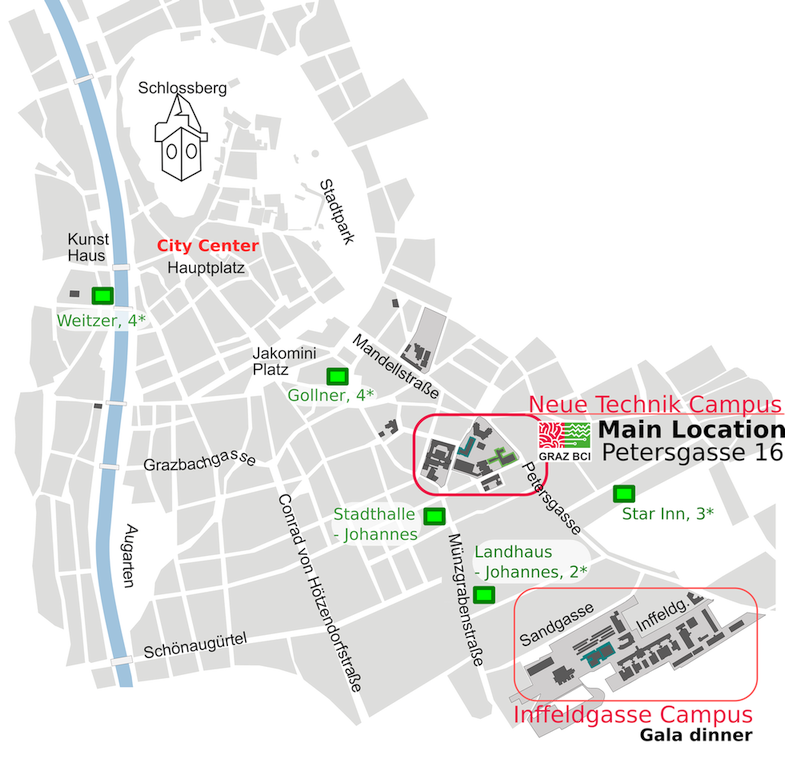 We can also recommend the following hotels during your stay here in Graz. Please keep in mind to book a hotel in time as also other conferences take place in September. Graz has an airport which is served with regular flights from Vienna, Munich, Frankfurt, Düsseldorf, and Zurich http://www.flughafen-graz.at/en/home.html . Graz is also easily reachable via trains of the austrian railways http://www.oebb.at/en/ . Please keep in mind that you may need a visa to go to Austria depending on your nationality. In case you need an invitation letter please contact us on bci2017noSpam@tugraz.at . Do not wait too long to apply for a visa since it can take a while to get one. For public transport information please click here. Nearest tram station is "Neue Technik" tram line 6. Registration is available on-site. Please be aware that we accept cash only and only Euro bank notes (no 200€ or 500€ notes). Online registration was open until September 4, and early bird registration was open until May, 31st. BCI society memberships will be checked, hence, please bring a membership confirmation. Participants who registered themselves as (PhD) students to get the discount, needs to show a valid student confirmation at the registration desk at the conference to receive their badge. Registration includes: access to the conference (Tue-Fri), opening cocktail (Tue), coffee breaks (Tue-Fri), lunches (Tue-Thu), gala dinner (Thu), open access proceedings. Travel to South Styrian Vineyard (Friday afternoon; includes wine, late lunch, bus; 35€; open until September, 20). Extra person to the gala dinner (Thursday evening; 75€; open until September 18). The add-ons can be booked via the eventbrite website.